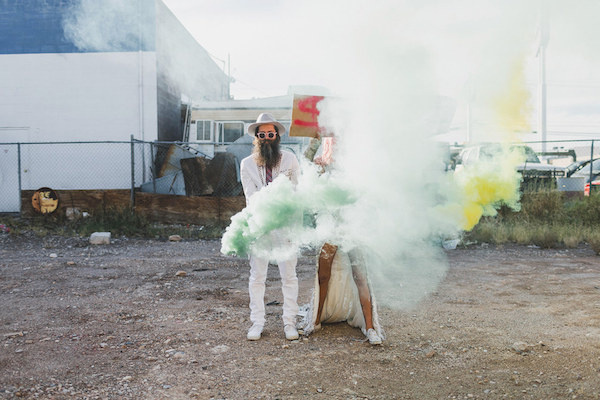 When I saw this wedding shoot I was stunned into silence for a few moments. I really didn't know what to think of it! In my mind, when I think of wedding photography, I think of a world of immaculate white dresses, expensive shoes, thoughtful furnishings and of course, smiling wedding couples and their guests.This hipster couple has gone down a different route and explicitly said that “Our #1 rule for our wedding was always to have an UN-WEDDING!” and their choice of photographer couldn't have done a better job to reflect their wishes in my opinion. In this shoot by Janneke Storm we see very epic wedding day story telling in a way that I have not seen it before. The couple pictured are Ainsley and Sebastien and they have said "I don’t think any photos or words could ever justify how much fun we had on the day." I love this as sometimes I do feel that some couples feel so much pressure on the day to do everything perfectly, they don't get much time to stop and simply enjoy their big day! Whilst their big day is clearly an unconventional take on a wedding ceremony, it at the same time provides a very personalized and effective glimpse into the perspective of this couple in a way that you don't always see. The couples' personalities shine through. I believe that one of the main goals of any wedding photographer is to capture the love that is shared between the couple, as well as the love that their family and friends have for them, too. 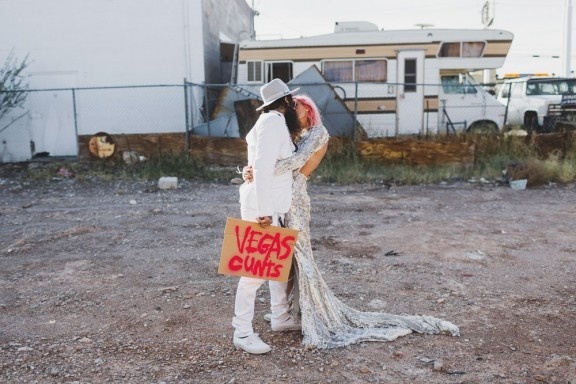 I think that these shots provide an intimate view into this hipster couple who eloped to Vegas and the gritty style that Storm uses really helps to emphasize that. What do you think of this shoot? Adam Bevan is a writer from London, England who has travelled to over 30 countries and continues to travel as a passion. His love of photography grew out of a business venture with a friend but continued to grow from there. He is currently working freelance while increasing the number of countries he's seen. HA! This is awesome. I know some couples who would be well suited for an approach like this. Not the conventional work I'd show my brides, but definitely something to keep on the back burner for those 'special' people. Nice share. And I like this concept "not at all". And that's the point - I don't care. I'm from the old (good) continent and we are not so afraid to say things as they are, not yet. Don't you hate it when people disappear and it looks like you're talking to yourself.. Completely agree with Vanitas. Some photographers aim for creativity and pushing the boundaries while others are content with taking the same average shots as every other photographer. Pretty cool , and a different take . What's important is what the couple wants and what look they're going after or agreed to. It may be disgusting to some , but one has to agree the shoot has a certain undeniable style to it . Ahh, memories to last a lifetime. The photos are really good, and the couple was very happy with them I'm sure, but the hipsterness doesn't feel as unique as it does oddly trendy, even if I haven't seen wedding photos like this before. 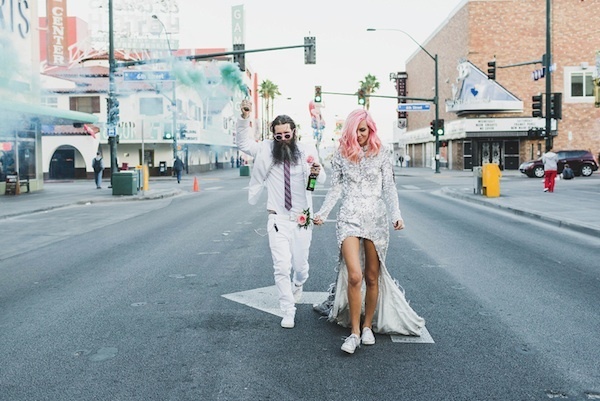 I think what would have caught my attention more would have been if these two eclectic people had a very traditional wedding that didn't unintentionally play into the stereotypes already assigned to them. 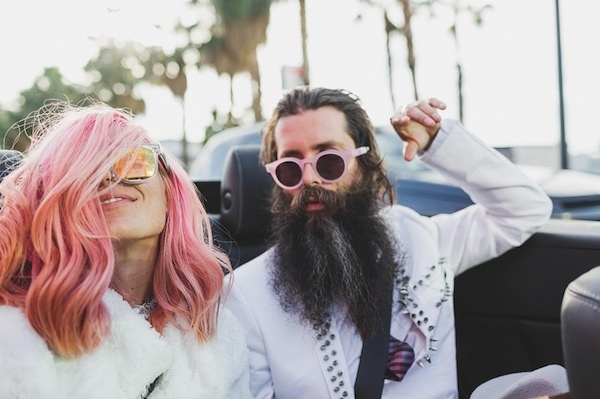 I mean, the fact that they're considered hipster by the authors of several articles I've read about this couple's photos already diminishes the feeling of uniqueness that I get from this set. Like I said, they're good images, but they don't really catch my eyes simply because...well...It's hard to explain. 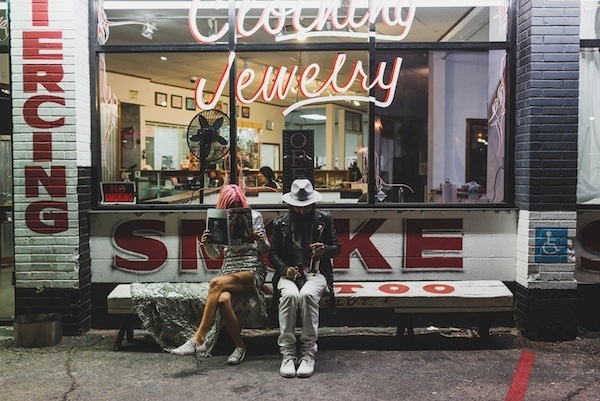 It feels spontaneous, but choreographed; bohemian but deliberate; genuine but theatrical. I do want to say, though, that I agree with the sentiment of this article and I hope the couple has a happy life. It is the job of the photographer to capture the personalities of the people getting married and I think the photographer did that well. 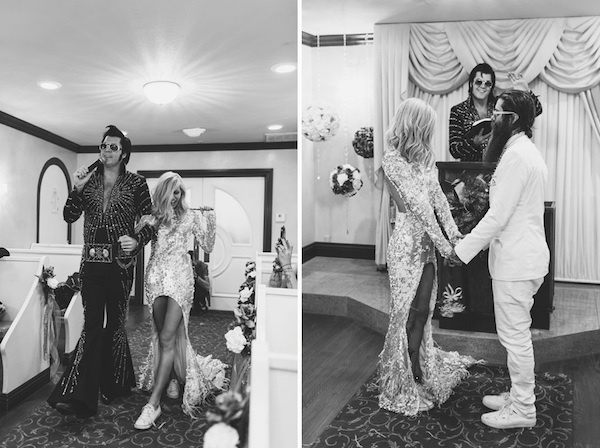 I just think we need to be cautious about buying into the (possible) fantasy that this wedding wasn't just as meticulously produced as those more conventional weddings. The internet can only provide us with selective experiences. What is seen and inferred is not always the truth. Crazy metalheads :) I kinda like these images. 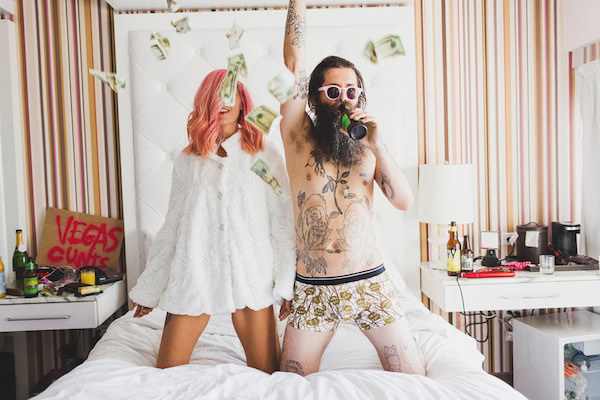 They're pretty unique for a 'wedding' shoot, and probably exactly what the couple were looking to capture. Ahhh. Get serious. These pictures are absolutely beautiful. I love each of them. But they are NOT wedding photography. Several locations, several costumes, proper lighting and everything. These have been taken during a span of several hours. What what happening at the wedding ceremony during all that time? The pictures are beautiful, but that's a "shooting day for a crazy couple". Not wedding photography. Congrats to the talents and the photographer. But... fix the title plz. Why are they not wedding photography? There was a ceremony. They just didn't see the need for a big ceremony and rather wanted to focus their day on the photos. Seems like a photographer's dream if you ask me. I don't believe that falling outside of a traditional wedding day schedule makes it any less of a wedding. Obviously it was shot on 2 separate days, so the 2nd part is more of a couples shoot. But the first part is wedding all the way. But where were the center pieces? It can't be a wedding without center pieces!!! 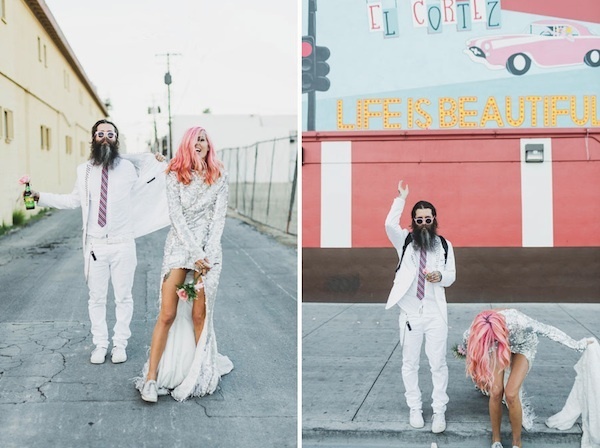 I have to clear some confusion here; there are actually two completely different shoots posted within the same post here, the Vegas wedding with Ainsley's pink hair and original outfits, then the Bali anniversary shoot done a year later with customised outfits and Ainsley's yellow hair. So yes completely different days! They most certainly did get married, yes it wasn't traditional in any way but they still stood in a chapel and said I do and made it official. I hope it can inspire couples to be themselves and not follow traditions if that's not their style. You did a great job on the photos! It looks like the kinda Wedding I could see myself having. i think they are cool. just because they are not your average wedding shoot does not make them disgusting. these people wanted a diff look and since they are the ones paying for it they get what they want. 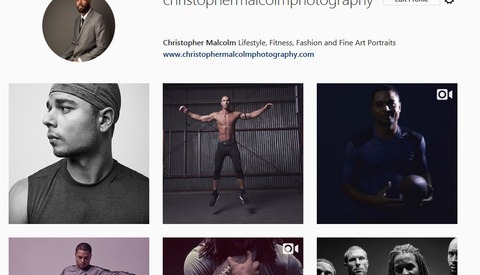 i think that sometimes photographers forget that they work for the client and not the other way around. step outside the box sometime. You're certainly entitled to your opinion, just not sure anyone wants to hear it. If you don't like it just say "not my thing." Why do you have to go to the extreme to call it disgusting. What if the bride and groom come on here and surf the comments. Why is it necessary to be so damn negative in the first place? People who share every opinion that pops into their heads without thinking about others are disgusting. I'd bet anyone $1 that Stepan only does missionary in the dark. I don't get it.... any of it. Ran into these images and some opinions. The pictures seem to present the couple as they may be. Hopefully the couple agrees. Most of the pictures are only relevant to the couple themselves I believe. In the exchange of opinions including S. Maxa I tend to agree with Maxa: If one is not open about ones true opinions it becomes difficult or even impossible to debate. This should though, never become personal in a forum like this. Different, creative, wild, and pretty cool.. I really like the post processing.